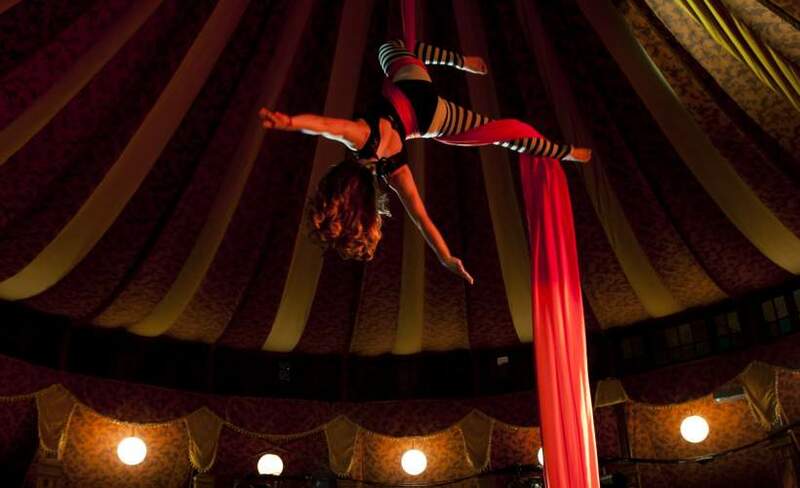 Known for their wild and decadent ambiance, Spiegeltents are exquisite pop-up venues that suit an eclectic performance programme. Literally translated as ‘mirror tent’, Spiegeltents were originally built in Belgium in the late 19th and early 20th centuries. The magnificent round tent is made of dark wood with intricately carved panels, stained glass windows, bevelled mirrors and an impressive draped ceiling. The boothed seating that lines the edges makes way for a grand dance floor with an in-built stage where performers such as Marlene Dietrech famously sung ‘Falling in Love Again’ in a Spiegeltent in Paris in the 1930’s. Nottingham’s traditional Goose Fair would see folk travel from far and wide to celebrate the end of harvest and pick up a Goose (or two) which were driven annually across the fens from Norfolk. Whilst as far as we know Spiegeltents were never hosted at the Goose Fair of old, entertainment was a significant feature of the event, both in the ale houses around Old Market Square and surrounding streets and in freak shows across the fair, where you could have expected to see literally anything from The smallest child in the world to The Yorkshire Giant Brothers, despite usually being an elaborate illusion from enterprising showmen. The Salon Perdu is one of a handful of the unique and legendary tents left in the world today; it has spent its life travelling the world from New York to Sydney, and since 2015 annually to Nottingham, as a small part of the Goose Fair returns to its spiritual home of Old Market Square.